GoXtra News: Michael Mikiala Facial Range - we encourage African men to give it a try! 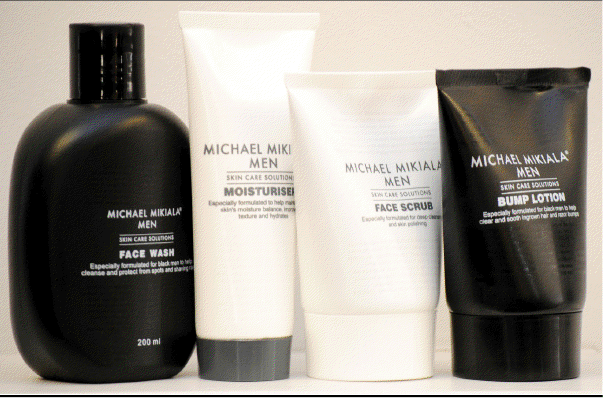 Michael Mikiala Facial Range - we encourage African men to give it a try! One of the best things a man can do to maintain a youthful appearance is to take great care of his skin early on. Although skin care is an individualized recipe, genetic makeup often times contributes to certain problem areas. Because of its texture and growth pattern, African/Black men are likely to battle with small bumps on the face commonly known as ingrown hairs, or razor bumps, often from shaving. African men are also prone to hyperpigmentation (dark spots) and dry skin. Before targeting problem areas, it is first important to discuss skin care basics to build a proper foundation. We encourage African men to give it a try!